Walk Description: This 17-mile ramble for Winter Walk and Bike Week offers beautiful views of the Front Range and plenty of sunshine while connecting three Boulder County municipalities: Longmont, Niwot, and Boulder. We’ll plan to take 8.5 hours for the journey, including stops for lunch at Snarf’s and tea at Celestial Seasonings. You can either opt in for the entire ramble or join us at any of 4 alternative starting points, all accessible by transit (please note the Saturday schedule on the RTD website). Come out for a fun winter walk in great company! All directions and timings are listed in the route map here. • Starting Point 1, Mile 0, 9 a.m.: Begin at the City of Longmont Recreation Center, 310 Quail Rd. Get here via the BOLT bus, or carpool. If driving, park in the north lot by the tennis courts. MEET the group on the path next to the tennis courts. • Starting Point 2, Mile 6, 11:30 a.m.: Take the BOLT bus to the Niwot Park and Ride and walk to Winot Coffee, 7960 Niwot Rd., where we’ll take a 30-minute break for snacks and greeting new people. • Starting Point 3, Mile 10, 1:30 p.m.: Take the 205 bus to the Gunbarrel Shopping Center and meet up with the group for lunch at Snarf’s Sandwiches. We’ll take a 45-minute break here. • Break, Mile 11.7, 3 p.m.: We’ll take a quick rest break and enjoy a cup of tea at the Celestial Seasonings Cafe, 4600 Sleepytime Dr., Boulder. • End Point, Mile 16, 5:30 p.m.: We’ll celebrate with a group dinner at The Roadhouse Boulder Depot! Go to https://rtd-denver.com/app/plan to search the RTD Trip Planner for ways to take transit to or from your chosen starting and ending points. Modify the start/end points and arrival time in the Trip Planner to discover the best way to meet us at each point. Walking Movement Leaders: Darcy Kitching and Ana Lucaci are two of the five core owners of the Walk2Connect Cooperative. Find their profiles and stories here. ~ Be sure to choose the starting point and walk length that is right for you, and tell us where you’ll start. ~ Dress comfortably in layers, with warm boots or shoes, hat, gloves, sunglasses and anything else you need to stay warm and comfortable. 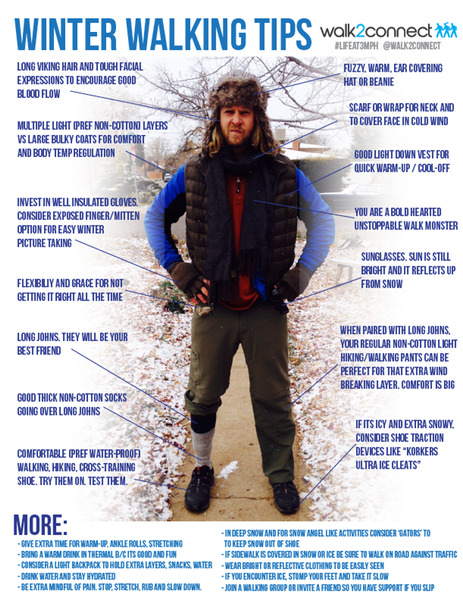 Review our Winter Walking Tips graphic here.